San Francisco (CNN) — Ross Turk would be happy to explain the tattoo on his arm. By now, he’s used to the penguin being met with bewildered stares. It represents, as he’d tell you, the Linux computing software, not the slightly less obscure character from 1950s cartoons. 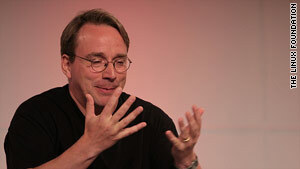 Linux creator Linus Torvalds at the LinuxCon 2011 event earlier this month. You can’t even fly on an airplane … you can’t use Facebook, you can’t buy a book from Amazon, without running into Linux. It’s time to burn the berets. The sanctity of the ad agency creative department used to be the exclusive domain of very special people. Super creatives dwelled there, using secret handshakes, runic noodling with pencils and cryptic eye movements and gestures to create advertising that was often overtly conceptual. You had to be a genius to understand it. Comprehension of the super concept came easy for a few, hard for most and firmly put advertising into two camps: creative that won awards and all the other stuff. Then came technology. The playing field was leveled. It was no longer only about the world we knew: print, radio and broadcast. It was about technology being bent, shaped and formed almost daily into new ways to relate to brands, products and advertising. Suddenly instead of the super league of creative geniuses telling the world what messaging and concepts they could see, people began telling brands what they wanted to see and how they wanted to feel. The berets have been burned. And from the ashes of all that pretense is rising the most exciting creative team ever known. The creative department is now all-inclusive. Advertising and brand engagement has become about creating experiences that are useful. The creative apartheid has ended. Now we invite technologists, planners, curators, clients, inventors, screenwriters to come inside and explore. And this, in and of itself, has enabled the most exciting time for agencies and brands to collaborate and create something relevant. The new creative team has taken shape.